For 20 years, my husband, Don, and I have created a car buying experience based on treating customers the way we ourselves would want to be treated. Infusing a culture of friendship, we have received the support of many new and loyal customers some who have purchased 10 or more vehicles from our showroom floor. But we can’t take all the credit for our dealership’s sales and service performance. The truth is that we have an amazing brand in Acura. It’s the flagship, luxury brand for Honda, and seems to continuously improve with age. 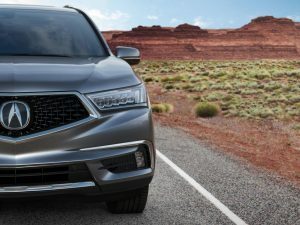 Edmunds.com Inc., an American online resource and trusted source for automotive information, recently named Acura’s MDX as the Most Wanted Luxury Midsize SUV for 2017. After analyzing a combination of market factors, Edmunds determined the 2017 Acura MDX earned the top spot in the luxury midsize SUV segment. In its inaugural year, Edmunds Most Wanted awards are unique in that they weigh the publication’s editorial team’s opinions with market factors such as sales, shopper interest and days to turn (the average number of days that vehicles remain in dealer inventory before they are sold). “The Edmunds Most Wanted designation gives car shoppers assurance that both other buyers and Edmunds’ experts believe these vehicles are a smart choice,” said Jessica Caldwell, Edmunds’ executive director of industry analysis, in a published statement. To come up with the Most Wanted list, Edmunds analyzed data from the first 10 months of 2016 for all model years on sale during that period. For each vehicle category, they identified which models commanded the most shopper consideration based on activity on the Edmunds website, had the highest sales and spent the lowest average number of days on dealer lots. The rankings for these three data sets were weighted equally to settle upon the finalists in the 16 segments. The editorial team then ranked the finalists based on Edmunds’ reviews of those models. To determine the winners, they took the average of the data rankings and the editorial team’s rankings. The results are the vehicles Edmunds would most recommend to car shoppers. Earlier this year, Acura announced the 2017 Acura MDX earned Top Safety Pick+, the highest designation from the Insurance Institute for Highway Safety (IIHS), for its fourth consecutive year. Annually the IIHS tests and evaluates two aspects of safety: crashworthiness (how well a vehicle protects its occupants in a crash), and crash avoidance and mitigation (technology that can prevent a crash or lessen its severity). Acura earned a total of two Top Safety Pick+ (Models 2017 MDX and 2017 RDX with available AcuraWatch) and two Top Safety Pick ratings (Models 2017 ILX with available AcuraWatch and 2017 RDX), making the brand a top leader in safety ratings in the automotive industry. Celebrating 20 years of friendship, Valencia Acura is one of Acura’s highest ranking dealerships in customer satisfaction, and one of the highest in the nation for customer loyalty. Stop by and see for yourself what all the excitement is about, and check out Acura’s complete line-up in the showroom. Celebrating 20 years serving the community, Valencia Acura is a local, family-owned car dealership located at 23955 Creekside Road in Valencia. Valencia Acura has been recognized as a prestigious Acura Precision Team Dealership for 11 years, awarded Acura’s Council of Excellence for 13 years, and voted Santa Clarita’s Best New Car Dealership for 13 years by the Signal newspaper. Owners Don and Cheri Fleming can be reached at (661) 255-3000. Visit www.ValenciaAcura.com.